Are you still struggling to overcome the masculine habits that prevent you from blending in or passing as a woman? Do you have serious doubts about your ability to express your femininity and be accepted as the woman that you are? To truly become the woman you want to be, you need to think and feel like a woman – from the inside out. Reprogram your mind and body so you can effortlessly express yourself as a woman. Transform your self image and start living as your true femme self. 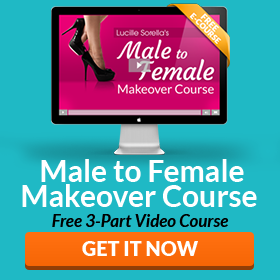 Eliminate the subconscious masculine habits that are preventing you from blending in or passing as a woman. Thanks again for the sweet comments, ladies!! LOVE YOU ALL!!!!! Thanks Lucille for creating an update without the male part included. I have to live a part of my life as a male but I want to think female all of the time and if my actions as a man seem to be feminine then it is not a problem I worry too much about anymore. I’m still not sure if this will work on me but if I can manage anything in the future it will be a copy of the feminization hypnosis. The reason is this little mini recording relaxes me and if that is so then maybe the longer versions will even change me a little more. The new versions are now available! Hope this helps! Thank you for you program. It allows me to BE feminine without guilt. You say to download the corrected version of one of the MP3s – but I don’t know how to do that. I missed your live session and maybe the Q & A covers this. I seem to go to sleep during the hypnofemme sessions and am wondering if I am getting the benefits, even though I don’t consciously hear the whole session. I would appreciate an email reply to the first paragraph. I am very pleased with all the free stuff you do. The value really amazes me. Thanks. The MP3 that is currently on the blog is the correct version. You can re-download if you have the original version. We did talk about falling asleep in the live Q & A. It’s ok, your subconscious mind still absorbs the suggestions – but it’s better if you can stay awake to also consciously hear them. Margot shared a lot of great tips during the live event, so make sure to download a copy from the download page. First I want to thank-you for all the work you are doing for the “community”. I have bought your hypnosis tapes and was happy; but, disappointed in them as well. I am a post-op and your tapes at the end of the sessions say go ahead and be a male (if you want to) .. to me that was a wake up session for that is not where I wanted to go back to. I was hoping for a tape that would assist in getting the years of maleness out of me, so I could bring out the woman that is hidden. Your tape touches on it; but, the male parts and going back to male kills it for me. The new versions have been uploaded to the download page! Hope this helps, Rachel! I’m sorry to hear that. The majority of my audience is not full-time so I needed to include the suggestions about reverting back to being a male. I will EDIT OUT the sections about going back to being a male and upload separate versions of the sessions for women like yourself. This way people can choose which version is most appropriate.